Read our exclusive and in-depth e-book guide to learn how to run a successful Facebook ad campaign for small businesses. We’ll help you set up your first Facebook advertising campaign and drive it to success. This guide has everything a small business owner needs to make a big impact online with successful Facebook Ads. We’ve all seen them: the Facebook ads that pop up on the side of our timelines, the ones that seem perfectly tailored to suit our tastes and likes. If you’re not super savvy in the social media department, you might think no one clicks on them, but you’d be mistaken. Truth is, Facebook is an extremely efficient tool with which to advertise your small business online, what with its capacity to reach 2 billion users. That’s the beauty of social media, it’s now so influential you can grow your small business without launching a massive marketing campaign that costs you thousands. What’s the deal with them exactly? Well, Facebook ads work by targeting users based on their public location, demographic and other profile information, most of which is only available on Facebook. Once you, the small business owner, create your ad – which we’ll explain how to do here – you set the budget yourself and bid for each click your ad gets. This Facebook ad guide is designed to teach small business owners to understand the ad process, and will show you how to carry out your first ad campaign. The best part is that you don’t need to be a proficient social media user to get ahead, it really is quite simple. Facebook is the largest and most popular social network of all, home to over 2 billion users worldwide. Businesses on the platform can tap into the huge potential audience by promoting their services or products through a Facebook advertising campaign. Due to changes in the platform’s algorithms, organic posts are not as effective as they once were, and now appear much lower down in the news feeds of consumers. Research shows that the average number of engagements with Facebook posts created by brands and publishers has fallen by over 20% since January 2017 with publishers on the platform seeing up to a 52% decline in organic reach. But it’s not all bad news. You can effectively tailor your Facebook Ads to reach your target audience and customer base. The platform has inbuilt analytics to help you track post performance and campaign success. It’s super simple to set up, especially once you’ve defined your main objectives. Customer Communication. Facebook gives you a platform upon which to directly communicate with your customers. While they’ll be gathering key information from your business, you’ll also be gathering key information from them as a customer, that you can then put to good use through your marketing strategy. Facebook Insights will give you valuable details and help you track and understand page performance. Social Interaction. Facebook is where your current customers and where your future customers all hang out. Even if they’re not looking for your business, Facebook Ads will target customers dependent on their tastes, making it the best way to reach customers who are looking for your services. You get ahead of the competition. Chances are your main competitors are all advertising on Facebook, and even if they’re not, you’ll be leaps and bounds ahead in terms of outreach. Facebook’s firepower is just so much more impactful than a local presence. Brand awareness. If even 100 people are looking at your business as a result of your ads, you’re winning. Credible advertisements help assign awareness of your brand and as a whole, will inspire more trust and loyalty in your customers. Having a Facebook business page isn’t enough. Facebook doesn’t let that many business updates show up on people’s news feeds anymore, meaning that the only effective way to reach customers is with Facebook Ads. Facebook helps your SEO. Believe it or not, Facebook helps you rank higher on Google if they are indexed by search engines. 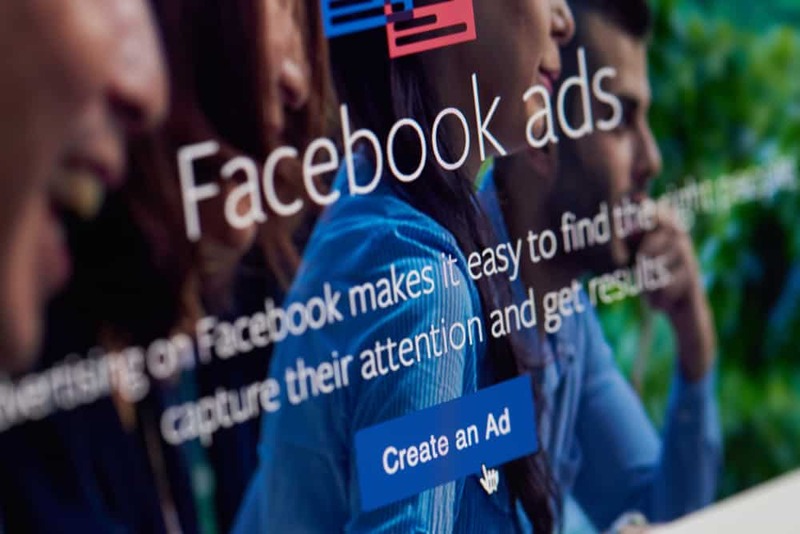 Before we delve any further, however, let’s debunk a few common myths which might have put you off from using Facebook Ads in the first place. Myth: It’s too complicated for someone like me, a small business owner, with no expertise. Fact: You don’t need to be a marketing professional or even a social media whiz to run successful ads on Facebook. Setting up a campaign on Facebook Ads is a straightforward process that over 5 million businesses use – and benefit from – each day. Myth: Facebook ads are too expensive – my small business can’t afford it. Fact: Facebook ads cost less than other online marketing channels with a minimum spend of £1 per day. You set a budget for each campaign, be that £5 or £500, and you only pay for returns. Myth: My Facebook Business page doesn’t have enough likes. Fact: Your business page doesn’t need to have tons of likes before you start putting out ads.The great thing about Facebook is that you already have a huge potential reach. Facebook will gladly serve your ad to any of its 2 billion users. All you need to do is tell Facebook what sort of person you want to target and you’re good to go. Now that we’ve debunked some common myths, here’s a rundown of 3 key benefits for investing in Facebook Ads. A major benefit of Facebook Advertising is its ability to target your exact audience by age, interests, behaviour, gender and location. If you think of who your average customer is, you’re defining the parameters by which Facebook can target. You’ll be using Facebook advertising as a way to really engage with customers and offer products and deals they won’t be able to refuse. For example, if you own a salon, your Facebook Ad can target people who have shown a specific interest in hair and beauty. This means your ad will pop up on their Facebook news feed and you’ll be appealing directly to potential customers. 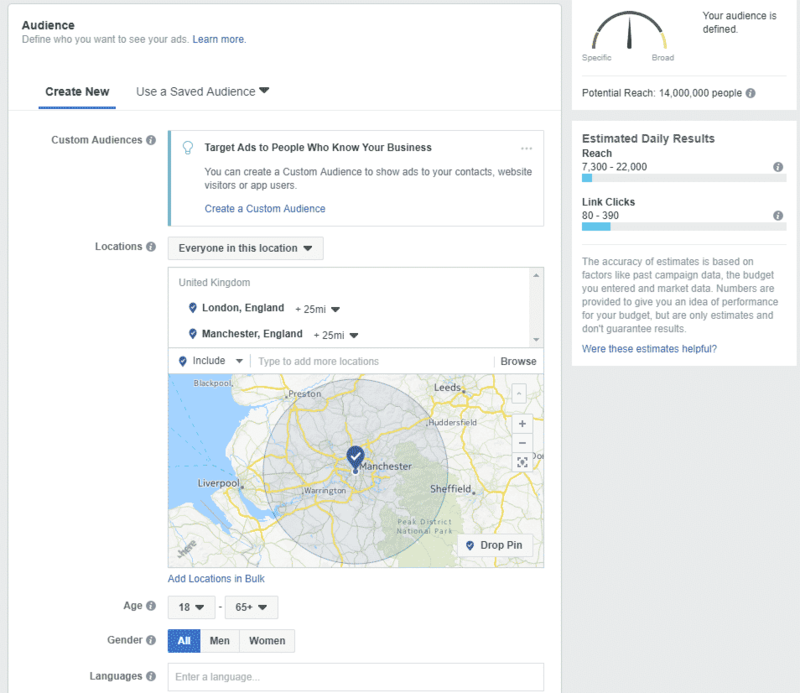 Facebook Ads can also target users specifically in your local area. For instance, if you run an electronics shop, then Facebook will target customers in the same area as your store. This is a huge benefit as it drives offline sales. A recent report found that Facebook ads drive up to 27% of in-store customers. Customers engage with paid social media ads on the platform and follow up with purchases in physical stores. This is a great benefit for small businesses who mostly operate out of physical stores, you can run ads that encourage customers to visit them. Facebook ad campaigns are measurable, giving you the ability to assess if they’re a worthwhile expense. You have insight into how many impressions, clicks and conversions each ad brings and you’re able to see these stats in real time. The advantage here is you can adjust your ad immediately based on their current performance. Facebook allows easy and quick interaction between customers and businesses. It’s easy to respond to customers on ads and if people can see you’re responsive to their queries, brand affinity and loyalty will develop as a result. Facebook also builds engagement like no other. Engagement in the form of likes, comments, and interactions on your post connects you with potential customers, and the stronger the connection the more likely they’ll convert. 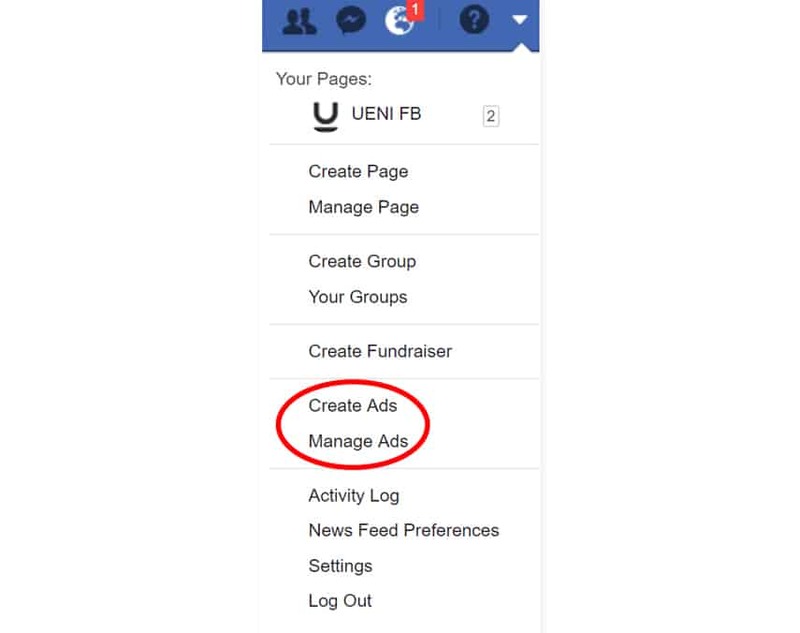 You can access this via a direct link at facebook.com/ads, or by clicking “Manage Ads” or ‘Create Ads’ in the drop-down menu on your Facebook account. For a campaign to be successful, it’s important to define the specific objectives of what you want to achieve. Do you want more people to know about a new product you’re launching? To download the latest e-book you created? Get people to sign up for a free trial? 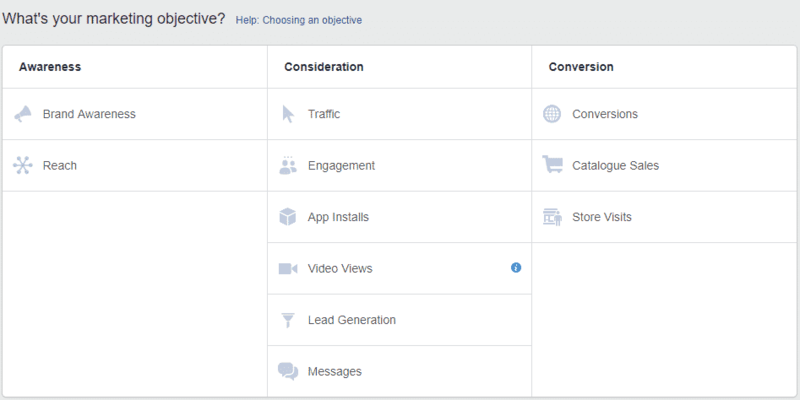 When you click to create a Facebook ad, you’ll go to a page where you choose the objective for your campaign. Conversions: Get people to take a specific action on your website (like subscribing to your mailing list or buying your product). Engagement: Expose a post to a wide audience to increase the number of likes, comments, shares, or photo views; increase your number of page likes; promote an event. Product Catalogue Sales: Connect your Facebook ads to your product catalogue to show people ads for the products they are most likely to want to buy. Store visits: Drive customers to your physical store. Behaviour-purchases, intent as well as device usage etc. Connections-option to show the ad to everyone or just those connected to your Facebook business page. In addition, with the connections setting, you can choose advanced targeting, which lets you include or exclude people who are connected to certain pages, apps, or events. You can also further customize your targeting using custom audiences to retarget people who have already interacted with your business. Here you can see the potential reach of people who may view your ad and a breakdown of estimated daily results, based on similar campaigns. Once you’ve selected your target audience, you need to select how much you would like to spend on the ad. It’s important to remember that this figure represents the maximum amount of money you want to spend. You can also set your budget to either Daily or Lifetime. 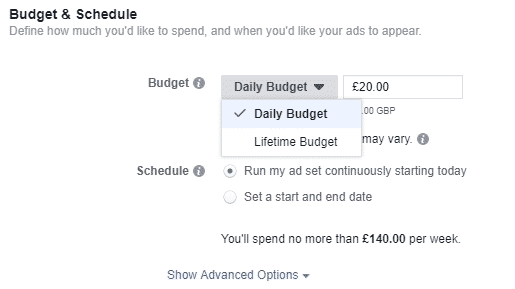 The former is the average that you’ll spend every day whilst the latter is the maximum that you’ll spend during the entirety of your advert set. Now it’s time to choose the images (or video) and text to accompany your ad. For the text, you get 90 characters to share a quick message that will appear above your image(s) or video. There are two ways to create adverts; using an existing post or creating a new advert. Here’s a quick look at both options. 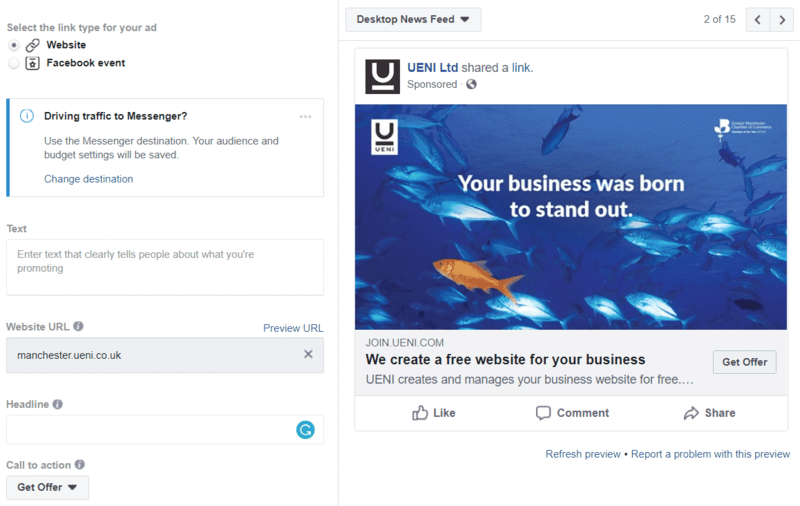 For certain types of adverts, such as boosting posts, you can create your ad using an existing post that’s already been shared on your Facebook page. To do this, select the ‘Use Existing Post’ option from the ‘Facebook Ads Manager’ dashboard. From here, you can choose which page you’d like to select a post from and pick an individual post from that page to use as your advert. Once the format is selected, you need to add the content to your advert (the images/video and text). This part is incredibly important to make your advert stand out in Facebook’s or Instagram’s feeds. If your ad is going to be a success, you want your image and text to be enticing enough to make people want to click on it. Advert placement defines where your advert is shown. With Facebook Ads, you’re able to choose which locations your advert will appear in. Adverts may appear in Facebook’s mobile News Feed, desktop News Feed and right column. You may also create ads to appear on Instagram, Facebook stories, messenger ads and sponsored messages. The picture below is how your ad would look on a desktop screen. Now, your advert should be ready to go. To submit your ad, click the ‘Place Order’ button at the bottom right-hand corner of the page. Once your ad is submitted, it’ll be reviewed by Facebook before it’s put live (you’ll receive a confirmation email from Facebook once the ad is live). 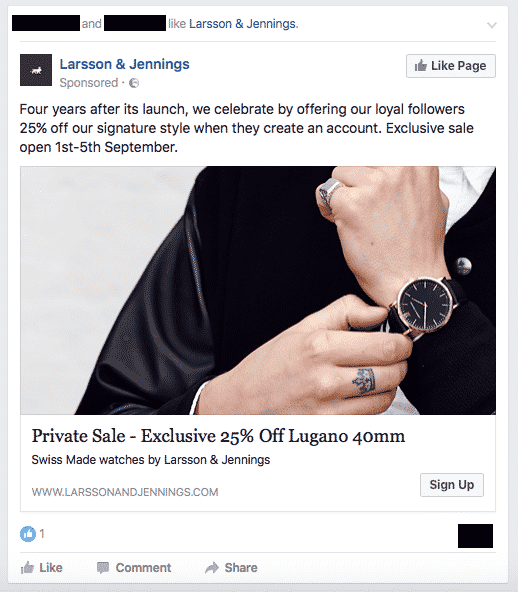 This ad from watch brand Larsson & Jennings takes on a different approach to a discount promotion, by offering exclusivity to drive the target audience to take action. The text is positioned with the element of exclusivity and the impression of scarcity (the sale period between the 1st and the 5th of September) that demands immediate action from the target audience. The product image is of someone wearing their watch as opposed to a picture of just the watch. This is more enticing as you can see how it looks being worn. This ad from Philips uses both video content and the carousel ad format. Each video demonstrates a use case of their new OneBlade razor. The text is short and sweet, outlining precisely the benefit of the product. Each of the videos in the carousel showcases the product being used in a different way, demonstrating the razor’s perks. This ad from Shopify delivers value to the target audience, boosting brand awareness in the process. This short punch text excels at triggering curiosity with three one-word questions and then bridging the curiosity gap by providing the answers in the content that’s being promoted. The image is also effective as it represents a sense of nostalgia and is aesthetically pleasing, linking in a sense to the rewards program. Use clear images/video to accompany your ad. This will engage your target audience and make them more likely to perform an action. You don’t need an expensive camera to take high-quality photos and there are tons of free photo editing apps and websites available such as Canva. If you want your target audience to take a specific action, don’t forget to tell them to do so. The key to correctly using CTAs in your ads is to keep them consistent between what your target audience will read in the ad, the link or carousel card title and the specific CTA button that you use. The same goes for when they visit the web page you are linking to in your ad. It’s important to use the inbuilt analytics tool to track the performance of your ads. These insights will enable you to optimise your ads for better results and show you what works (and what doesn’t) for future campaigns. So there you have it, the main breakdown of how to run a Facebook Advertising campaign, but if you still need an extra hand, click here to download our exclusive e-book, which describes in elaborate detail how to launch successful Facebook Ad campaigns for small businesses. Stephanie Ozuo is a Marketing Executive and social media influencer based in London. She is passionate about social issues and politics and her opinions have been featured in Buzzfeed, RT, and Al Jazeera.